This airy summer top is light, soft and sweet. The short sleeves and generous V-neck make it perfect for the warmer months of the year, and the detail of the knit let it stand out without being overwhelming. It's great for layering. It’s knit top-down as one piece, resulting in a seamlessly smooth appearance that extends to the hem. The knit is simple enough, while the motif of slip-stitches takes the greatest advantage of the hand-dyed yarn. 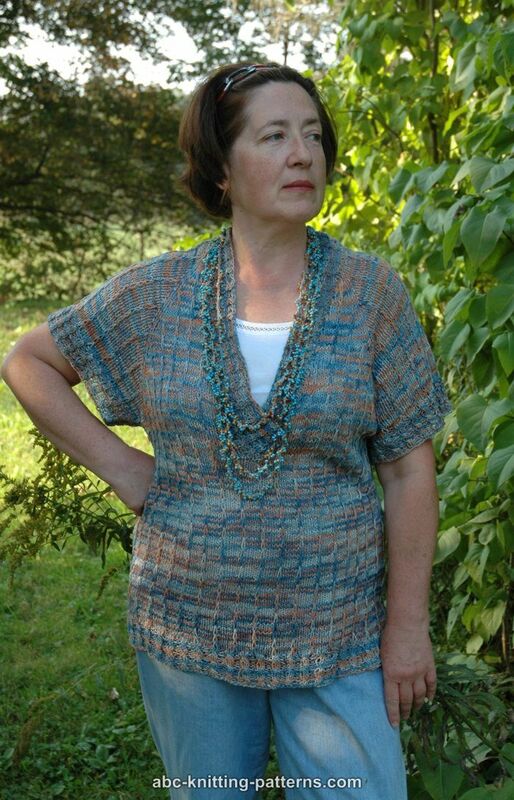 Cables in the rib edging, around the hem, the neckline and the sleeves add another interesting touch. Gauge for stocking stitch: 20 st x 28 rows = 4" x 4" (10 x 10 cm). Cast on and purl 1 row. Row 1 (RS): k 4, *k 1 wrapping yarn twice around needle, k 4*, repeat to the end of the row. Row 2: p 4, *sl 1 wyif dropping extra wrap, p 4*, repeat to the end of the row. Row 3: k 4, *sl 1 wyib, k 4*, repeat to the end of the row. Row 4: p 4, *sl 1 wyif, p 4*, repeat to the end of the row. Cast on and knit 1 row. Round 1 (RS): *k 1 wrapping yarn twice around needle, k 4*, repeat to the end of the round. Round 2: *sl 1 wyib dropping extra wrap, k 4*, repeat to the end of the round. Round 3: *sl 1 wyib, k 4*, repeat to the end of the round. Round 4: *sl 1 wyib, k 4*, repeat to the end of the round. Row 2: *k 2, p 2*. Row 3: *C2B (sl next st to cable needle and hold in back, k 1, k 1 from cable needle), p 2*. Round 2: *k 2, p 2*. Round 3: *C2B (sl next st to cable needle and hold in back, k 1, k 1 from cable needle), p 2*. Cast on 49 (51, 55, 55, 63, 65, 69) sts and purl 1 row. Divide stitches as follows: 1 edge st, 1 st (left front), 1 st (raglan line, place marker), 8 (8, 9, 9, 11, 11, 12) sts (left sleeve), 1 st (raglan line, place marker), 25 (27, 29, 29, 33, 35, 37) sts (back), 1 st (raglan line, place marker), 8 (8, 9, 9, 11, 11, 12) sts (right sleeve), 1 st (raglan line, place marker), 1 sts (right front), 1 edge st.
Work Slip-Stitch pattern for 48 (54, 60, 68, 74, 82, 88) rows increasing for 8 sts (double increase at the raglan sts) in each odd row as follows: M1, k1, M1 at the raglan st. At the same time increase for 1 st at the beginning and the end of the row (2 sts per row) in every 6th row 10 (11, 12, 12, 14, 15, 16) times. 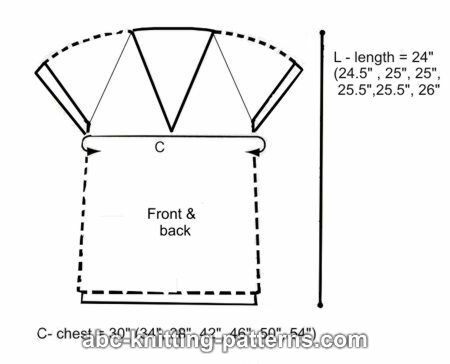 You have to work 60 (66, 72, 72, 84, 90, 96) rows to shape the neckline. Row 61: Transfer left sleeve sts to a length of yarn, cast on 3 (4, 5, 5, 6, 6, 7) sts with single cast on, work back sts, transfer right sleeve sts to a length of yarn, cast on 3 (4, 5, 5, 6, 6, 7) sts with single cast on and work front stitches. Continue to work bodice back and forth, rows 48-60 (54-66, 60-72, 68-72, 74-84, 82-90, 88-96). Row 61 (67, 73, 73, 85, 91, 97): at the end of the row cast on 1 st with the single cast on and continue to work in rounds. Place marker on the front central st.
Work slip-stitch pattern for 76 (80, 84, 84, 88, 88, 92) rounds. Work cable rib for 14 rounds. Cast off. Transfer sleeve sts from the yarn to the needles and pick up 3 (4, 5, 5, 6, 6, 7) sts over the 3 (4, 5, 5, 6, 6, 7) underarm sts. Work cable rib for 14 rounds. Cast off. 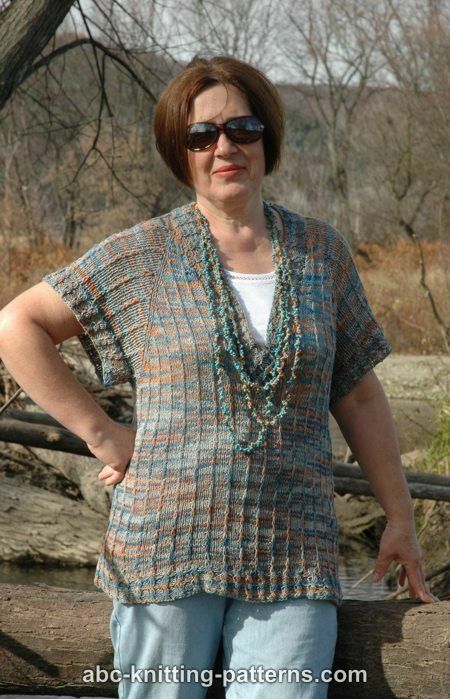 Pick up sts on circular needles along the neckline and knit cable rib for 14 rows. Cast off. 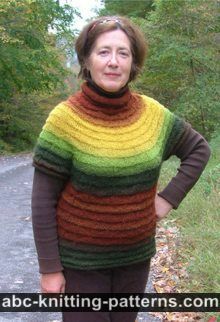 Since the yarn for this sweater has been discontinued, what is a good substitute? 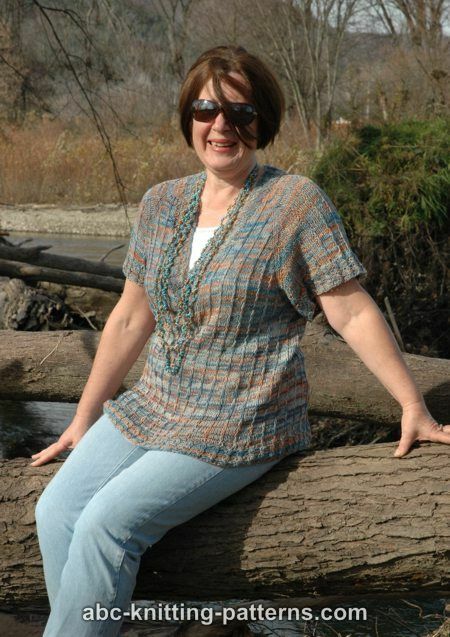 You can use Silky Merino by Malabrigo Yarn, Silk Blend by Manos del Uruguay, Silky Wool by Elsebeth Lavold. Me too !!! 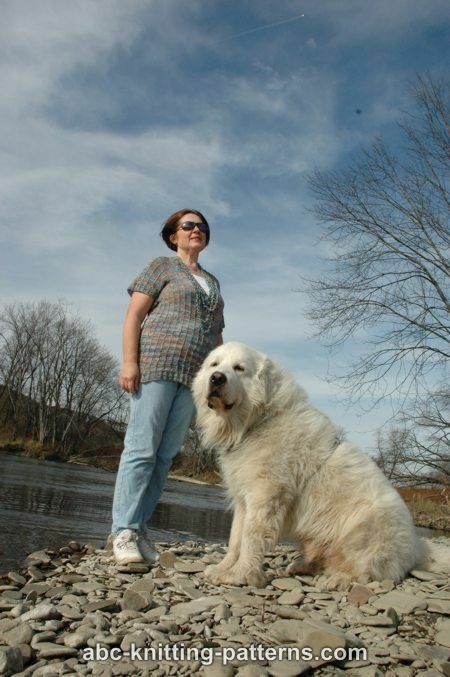 I love Great Pyrenees !! 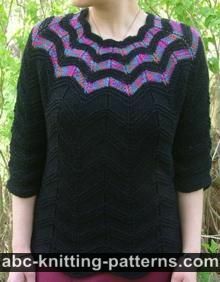 Would love to make this top, it is stunning. 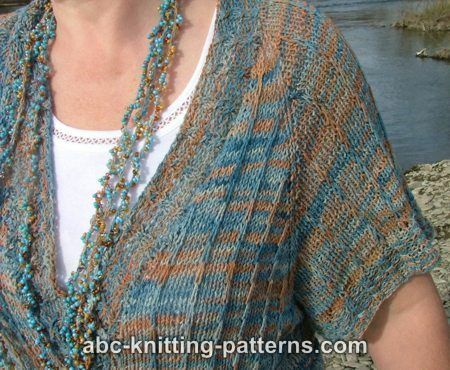 Is it possible to convert the pattern for straight needles as I don't knit with circulars? ?I don't mind sewing up so would prefer the conventional front,back, sleeves etc.Can anyone help a fellow knitter out?? Although it has a printable version there is no "print" tab to hit on. How do I download this so I can print in out? 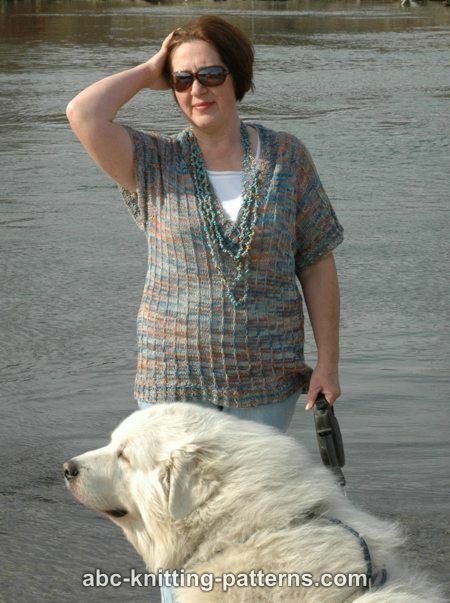 Wonder if this could be made as a cardi?. Looking for something lite to wear to church over sleevless dresses.